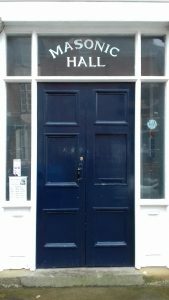 I thought I’d do a post on seven Masonic Halls that I’ve visited this year and despite constantly hearing that Freemasonry is declining, visiting these halls reminds me that it seems to be thriving and that there is still a rich culture of Masonic history and ritual practice. Here is the list of halls I’ve visited, either from giving talks or just being a visitor, some have a quirky local feel, others have a more modern air about them, but all are special in their own way. I’ve not actually visited a lodge in this relatively small Masonic Hall in Beaumaris, Anglesey, but I have wandered into the building. The blue door on the street invites you upstairs where the lodge room meets. The rooms below are used as a wool shop, which gives revenue to the Hall. Two lodges and one chapter meet in Beaumaris; Beaumaris Lodge No. 5347, its chapter of the same name and Bonover Lodge No. 8971. However, the wider North-Welsh Masonic scene sees a lot of visiting brethren and inter-relationships between lodges and Masonic Halls all along the coast line and into the smaller towns in the mountains. Llanfairfechan Masonic Hall in North Wales looks like it was once an old chapel, and has a striking square and compass design on the front made out of local slate. Only a small number of lodges meet here; Penmaenmawr Lodge No. 4417, its chapter of the same name and St Mary’s Lodge No. 7061. It has a rather quaint feel to it and is somewhat hidden away on Station Road, a road that leads you to the sea front. I’ve given a number of talks to various lodges that meet at Elwy Hall in Rhyl, North Wales – you can read an article I wrote here about the talk. It’s a modern Masonic Hall with a lodge and chapter room, bar area, ante-rooms and a fantastic dining room offering great meals. Quite a large number of lodges and chapters meet here such as Cambrensis Lodge No. 5523 and Elwy Lodge No. 4721. This is another quaint Welsh Masonic Hall, a Hall that I featured in my second book The Transformation of Freemasonry. The Hall now occupies an old school house and has a date stone revealing the year 1913. It’s a beautiful sandstone building and has dining facilities in a separate building next door. The building also has a museum and a main lodge room, and has a number of lodges meeting there including St. Deiniol’s No. 3273 which I visited earlier this year. Kerneforde Masonic Hall is relatively new, being a building that a number of lodges bought and made it into a new hall with modern facilities; a large lodge room, large dining room, bar and ante-room. The hall is based at the historical railway town of Carnforth near the border of Lancashire and Cumbria in the northwest of England. I gave a talk to Vale Chapter No. 5256 which met in the hall and was treated to the local cuisine. 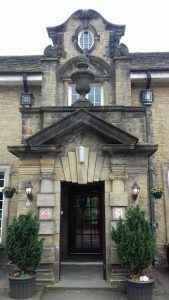 The Masonic Hall at Hoyle Court in Otley near Shipley in West Yorkshire is a beautiful 19th century Baroque Mansion – an architectural delight that was once the home of the local Ambler family and is now the meeting place for a number of lodges and chapters. There are a couple of lodge rooms, an elegant dining room, a bar area and a display area showing some rare Masonic delights. The hall also does events like weddings, a way for many a Masonic Hall these days to survive. I gave a talk to a chapter there recently which can be seen here. The hall is situated in the south end of Liverpool in the northwest of England, and has some historical Liverpool lodges meeting there such as the Lodge of Harmony No. 220. The Lodge of Harmony had a small role in the Liverpool Masonic Rebellion of 1823 and there are some hidden historical Masonic gems on display in the hall. I had the pleasure of giving a talk to Excelsior Lodge No. 3580 last year, a lodge that meets in the hall and was told the windows were bricked up a few years ago but the exact reason why has been lost in time, it could have been for security or privacy, or both.